Are you planning on visiting Israel? The greatest gift you can give is the gift you leave behind. Give the gift of your blood when you visit! When visiting Israel, either as an individual or in a group, you can donate blood to MDA Israel. Donations of blood are accepted once every three months. To arrange your blood donation call (02) 651-1852 (in Jerusalem) or (03) 530-0400 (in Tel Aviv). Israeli National Blood Services is a division of Magen David Adom Israel, which is responsible for the collection, processing, testing and distribution of blood units and blood products throughout the country. It includes the central Blood Bank, which was inaugurated in 1987, and the Fractionation plant – inaugurated in 1996. The Centre is located in Tel-Hashomer, (15 minutes drive from Tel-Aviv, and 45 minutes from Jerusalem), and employs around 120 workers, such as laboratory technicians and phlebotomists. Over 250,000 blood units are collected yearly from volunteers: 75% of which are collected using MDA Mobil Units in schools, factories, community centres and army camps. 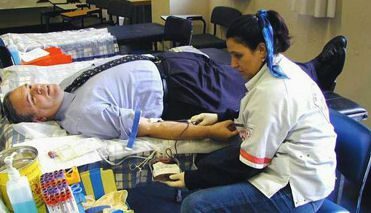 The other 25% are collected in fixed donor rooms at MDA first-aid stations located in towns and cities all over Israel. FOR ISRAEL RESIDENTS ONLY: All volunteer blood donors are offered the MDA-Blood-Insurance program, which grants further credit of blood for the donor and his/her immediate family members for one year following the donation. This credit saves donors from needing to bring “replacement-units” in case they need a transfusion during the 12 months following their blood donation. Over 90% of the units collected each day are processed into components such as packed red blood cells, fresh frozen plasma, cryoprecipitate and platelets. All donations are tested for blood type (ABO, Rh) and for the detection of irregular antibodies to red cell antigens. In addition, all units are tested to identify transfusion-transmitted diseases such as Hepatitis B, C, HIV 1/2, HTLV and Syphilis. They are also tested for ALT levels. Around 240,000 blood units, and another 240,000 units of the different components are supplied to all hospitals in Israel upon their request. In addition, some 25,000 litres of surplus plasma are supplied to the MDA Plasma Fractionation Centre, a modern, high-tech, state-of-the art pharmaceutical plant, for the preparation of albumin, gamma-globulin, factor VIII and other products. MDA Blood Services research and development laboratories are involved in projects such as the implementation of novel methods for the use of blood products as future therapeutic means, and in the development of new and safer systems for the collection of blood samples from the donors. For more information, please contact your local State MDA Office.